I made this advent calendar last year for my amazing advent-adoring friend Annie. Sadly, I didn't get co-ordinated enough to make an advent calendar this year (sorry, Annie! 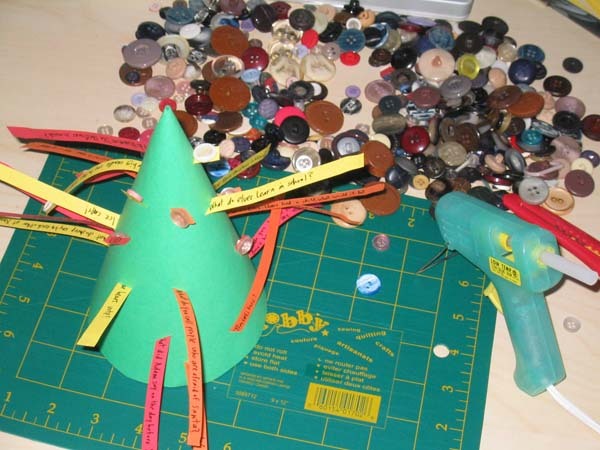 ), but I thought I'd share a quick tutorial with everyone on how to make what I hereby dub ... the 3D Joke Tree Advent Calendar! The basic idea is that instead of chocolate or a picture, you get a new Christmas or holiday joke every day. You could also adapt this idea to include holiday or winter trivia instead, if that's your thing. 1. Grab some festively coloured paper and cut it into strips about 1/2" wide and 4" or 5" long. 4. 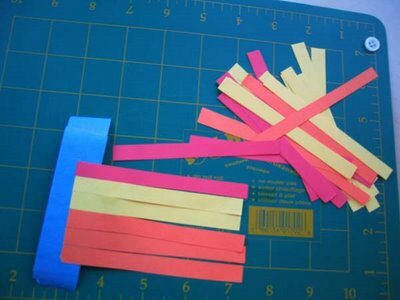 Take a sheet of green paper and cut little slits in it at different angles. 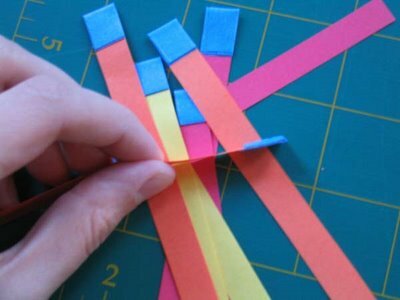 This is where he joke-strips will slide through, so the slits should be slightly larger than the strips of paper, say 3/4". 5. Curl the green paper into a cone. Glue or tape it in place, then trim round the bottom so your tree can sit flat on the table without tipping over. 7. At end of each joke-strips write a number from 1 to 24 on one side. On the other side, glue on a button. I used a glue gun, but regular white glue should work if you're patient. Glue a yellow button or yellow paper star on the top of the tree. 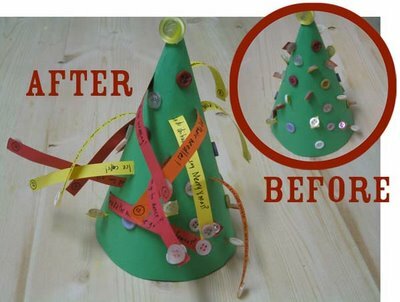 When the glue is dry, push all the strips back into the tree, so just the buttons are showing, ready to be pulled out day by day. And that's it! You're ready to advent. I love this, great idea!!!!! that is the best advent calender I have seen after hours of blog/internet searches - thank you so much for solving that particular problem form me! great to find a new blog too! that is the best advent calender I have seen in hours of blog browsing - thank you so much for solving that particular problem for me this year!! Thanks Katie! I hope you enjoy your advent! Thankx, This looks like a lot of fun. Got to make me one.